I might be a little paranoid but I think games are starting to follow me around. I get points and badges every time I share my location with friends using Foursquare, I’ve levelled up twice in the last week just by completing tasks on the Epic Win to do list app and I outran two zombie mobs during my run last night. These apps are part of a bigger trend that has gained immense popularity over the last year or so known asgamification. Gamification is being heralded as the way to engage users with products and the number of ‘gamified’ products hitting the market is increasing so much so that by the year 2015 we could see 50% of all organisations gamifying their innovation processes . Gamification is also being tossed around as simply a buzzword, a meaningless word full of promises of increasing user loyalty – potentially something that could potentially provide the missing step for the gnomes from South Park? However, difficulty arises when attempting to understand what gamification exactly means, separating it from the notion of serious or pervasive, persuasive games and then trying to classify what exactly is gamified and what isn’t. However, regardless of whether it’s game elements being used in a non-game context or if it’s a complete serious game, the drive behind using games and game elements in this way is the same; to motivate and engage through fun and enjoyment. If this is the case then the focus should be on the design of the game elements, drawing from game design theory and understanding the motivation to play games in order to create the most engaging player experience that will keep people playing. Although the word has been around for a couple of years now there have been few attempts to define the term scientifically. The most complete and solid definition proposed has been by Deterding, Dixon, Khaled and Nacke  who define gamification as “the use of game design elements in non-game contexts“. 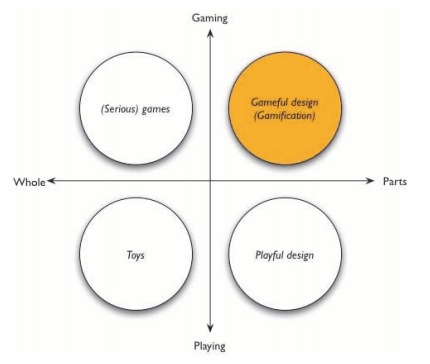 With this definition the authors aim to separate gamification (or alternatively ‘gameful design’) from toys,playful design and (serious) games in terms of two dimensions, one that distinguishes between playing and gaming and the other between whole and parts. In this way gamification can be seen as relating closer to games (i.e. structured and with explicit rules) rather than design that incorporates elements of play (i.e. unstructured and spontaneous) . Also, the term gamification denotes an artifact with game elements rather than a full-fledged game but the authors do note that this boundary between these two can be blurry at the best of times. Take for example Foursquare, is it a game or a mobile app with game elements? This could depend on a number of things such as how people use it or on what the designer intended . In terms of a game element, this could potentially be anything from game aesthetics such as graphics and progress bars, to complete games with an overarching goal, rules, story, levels, quests and achievements all powered by real actions. Gamifying something entails adding any number of game elements, such as those listed, to a non-game context to enhance the user experience or increase motivation and engagement. Overall gamification generally has the goal to make a more appealing product or create a more active and motivated user base. For an example, have a look at the two different to-do applications below, on the left is Remember the Milk and on the right is Epic Win. 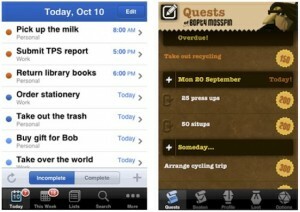 Remember the Milk has a robust to-do list iPhone application with all the functions you need in order to add and check off completed tasks. The Epic Win iPhone application on the other hand looks more like a quest log in a game, however it is in fact another to-do list application that employs a number of game elements such as game aesthetics, language, avatars, levelling, experience points, loot and maps. Both applications provide the same basic functionality however by integrating game elements, Epic Win attempts to make the action of completing tasks fun, playful and engaging by framing them as epic quests. The adoption of gamification in both industry and research has been wide spread over a range of different domains including health, education, greener living and software applications. So it sounds like something great, right? Awesome, but how would you go about using gamification techniques and how do you design for such game-like experiences? One size fits all: badges, leaderboards and points. If you own a website then you could integrate game elements into it using what’s known as “instant gamification platforms”  provided by vendors such as Bunchball and Badgeville. These gamification platforms provide a kind of one size fits all approach, with a range of game elements available for addition to websites to drive participation and engagement. They provide APIs and components that allow site administrators to reward particular user behaviours such as commenting, registration, purchases, social sharing and taking quizzes with virtual game rewards such as levels, points, achievements or tangible rewards such as special offers and premium content. The problem that can arise with these types of game elements are they are primarily reward based elements that aim to motivate users extrinsically. This kind of design lacks some serious fundamentals elements that makes games fun to play. To understand this further let’s (very) briefly discuss motivation theory. It is generally accepted that there are two types of motivation; extrinsic and intrinsic . Extrinsic motivation occurs when an activity is performed in order to attain some external orseparable outcome, such as working harder for a pay rise or to get a promotion. On the other intrinsic motivation occurs when an activity is performed for the internal satisfaction of undertaking the activity itself, such as working for the joy of working. The act of playing a game is generally considered an enjoyable and intrinsically satisfying activity on its own  (Ryan et al., 2006). Therefore the general idea behind gamification is that it attempts to harness this enjoyment and fun that people find from games and use it to frame non-game contexts as game-like in order to make them more enjoyable and motivating also. However problems can arise when rewards are the primary element used in gamification designs, whether they are points, badges or real rewards they are simply promoting extrinsic motivation to complete tasks – write 3 posts to unlock an achievement! And these are the biggest issues with plug and play gamification platforms at the moment, they are primarily reward based with no larger goal or no thought about the challenge involved in the task. There are reasons why this is happening – these types of reward systems are easy and cheap to implement, and can be applied to very quantitive actions that can be easily detected by the system (such as the number of comments posted on a website, whether a user has their twitter account hooked up). However to truly create an engaging gamification experience rewards are simply not enough to satisfy the user. So the question arises, what helps to create a more enjoyable gamification design? If the act of playing a game is generally considered an enjoyable and intrinsically satisfying activity on its own then we should consider what makes it so motivating to play. Ryan et al. hypothesise that games are primarily motivating to the extent that players experience autonomy, competence and relatedness while playing – three basic psychological needs that promote intrinsic motivation. 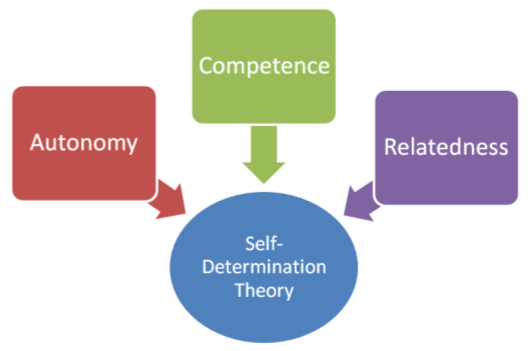 This theory is referred to as Self-Determination Theory. If the addition of game elements to a non-game context promote play in a similar way to games then supporting these three needs can potentially create a more enjoyable gamification experience. And through this enjoyment ,engagement may increase in the non-game context the game elements are being applied to. Autonomy refers to the choices people make and why they make them. When people choose to take on an activity for interest or personal value rather than for rewards or because they are made to do it, then perceived autonomy is high. If gamification is an optional element added to a non-game context that people can choose to engage with then autonomy would be high. Within the gamification design, if players are given the freedom of choice over the sequence of actions they undertake and are not forced to one specific path then autonomy would be high. Competence refers to the ability to optimally challenge people, in games if the controls are intuitive and the tasks within the game provide ongoing optimal challenges and opportunities for positive feedback then competence would be high. Competence relates also to Flow theory  a particular theory of motivation proposed by Csíkszentmihályi that describes a mental state of operation where a person is fully and completely immersed in an activity. 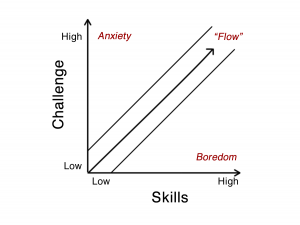 To promote flow a challenge needs to be provided that is appropriate for the skill level of a person. A challenge too hard and the person may feel anxious and overwhelmed, while a challenge too easy can bore a person. Finally, relatedness refers to a person’s connection with others, in a game this may be with computer generated personalities or with other players. The need to interact, be connected to and experience caring for others can be a powerful motivator. If these three elements are considered when designing game elements for non-game contexts, rather than simply falling back to motivation by rewards, then the player might be more engaged with the non-game context. There’s so much I haven’t touched on here (e.g. the links between pervasive games and gamification, using gamification to attend to different levels of extrinsic motivation, the importance of creating good mappings between goals and actions of the non-game context and the game goals and actions, and on and on…) however it’s enough hopefully to get you started thinking more about the area. Gamification is a very new field, still being defined with a lot of research possibilities available. As I continue my Phd into this area I’m personally interested in research into the importance of mapping meaningful game actions and goals to the contexts in which they are applied, as well as exploring the promotion of player enjoyment in gamification design to enhance motivation. I aim to adopt a model of player engagement from game theory to aid and inform the design of future gamification designs, in particular for mobile contexts. These guidelines will be evaluated using a number of case studies, the first which looks at turning the daily commute into a game in order to encourage greener transport options. That’s it for now! Quite a long read – if you’ve made it this far then achievement unlocked! (Just kidding). If you have any comments or questions add them below or email me with your thoughts! Deterding, S., Khaled, R., Nacke, L., & Dixon, D. (2011). Gamification: Toward a definition. CHI 2011. Presented at the Computer Human Interaction, Vancouver, British Columbia, Canada: ACM. Caillois, R. (1961). Man, Play, and Games. Zichermann, G., & Cunninghame, C. (2011). Gamification by Design. O’Reilly Media. Ryan, R. M., Rigby, C. S., & Przybylski, A. (2006). The Motivational Pull of Video Games: A Self-Determination Theory Approach. Motivation and Emotion, 30(4), 344–360. An epic comic that highlights an interesting issue into the ethics of gamification, but hopefully does not predict its future. Great article! I’ve been following the evolution of gamfication for the past year and this is one of the most sensible articles I’ve read so far. I’m have a background in positive psychology and am doing my PhD on Play in Organizations and looking at gamification as one form of deliberate play. The last few months I’ve been lucky enough to chat with Ed Deci on the role of self-determination theory and Mike Csikszentmihalyi on flow about gamification applications for their work. If you’d like to chat at any point and compare notes just let me know. Really great article, have to do some deeper reading laterwards, should be able to learn something for my gamma project. By the way, what do you think about my first post? I’d really appreciate some feedback 😉 Last but not least, Thx for the like. I like this article too, maybe even better.